“I love BRAVO because it’s an opportunity to meet new people and you get to do different things like going to concerts, going on field trips, playing music in front of people.” This 5th grade cellist at Rosa Parks is in her second year with BRAVO. She likes playing for people because the practice makes her face her fear and she becomes less scared. 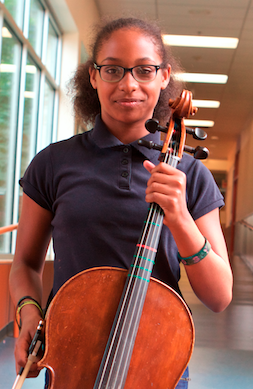 Kaniah loves her instrument and says that playing music calms her down and makes her happy. She especially likes popular music. 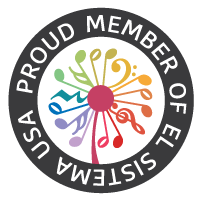 Looking back on her first year as a cellist, she is proud of how she has improved. Kaniah loves history and wants to be a psychologist, so she can help people. The people she admires most in the world are her mother and Serena Williams. Her mom always helps her when she feels badly, and pays close attention to her. Kaniah admires Serena Williams because she practiced tennis so hard every day when she was a kid, with her dad and her sister, and because she has made a commitment to her craft. “BRAVO is awesome. One thing I’ve learned here that will help me in my life: Follow your dreams.” We think Kaniah’s future looks pretty bright and can’t wait to see those dreams come true.